Order your 1.25 oz 2017 Canadian Bison silver coin from our online store today to enjoy the lowest price on the web. Established in 1908, The Royal Canadian Mint has delivered numerous successful bullion series featuring North American Wildlife and, with this offering, the majestic Bison is sure to push their reputation for excellence to new heights. The reverse feature depicts a proud and remarkably detailed American Bison, traversing the Canadian wilderness, set within a dazzling border of radial line design. Also on the reverse, you'll find the country and year of origin, as well as the metal content weight and purity of the coin. The obverse feature is none other than Susanna Blunt's famous effigy of Elizabeth II, depicted in her youth and donning her beloved pearl necklace. Also on the obverse is Elizabeth II's formal title, as well as the coin's unique denominational value. The American Bison or Buffalo, which once roamed the plains North America in unfathomable droves, was hunted to near extinction but now populations are back on the rise, thanks to determined conservation efforts. 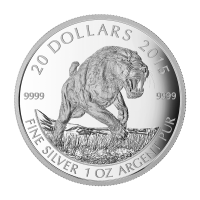 Celebrate the largest terrestrial animal and fortify your holdings with a 1.25 oz Canadian Bison silver coin today. In multiples of 20 these coins will be shipped in a plastic tube. In multiples of 400 these coins will be shipped in a monster box. 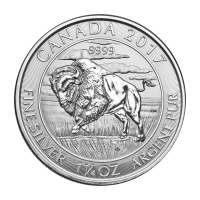 Rückseite Bild eines rennenden Bison und die Worte "Canada 2017 Fine Silver 1 1/4 oz Argent Pur 9999" (Kanada 2017 Feinsilber 1 1/4 oz reines Silber 9999), sowie die Initialen des Künstlers. Bild eines rennenden Bison und die Worte "Canada 2017 Fine Silver 1 1/4 oz Argent Pur 9999" (Kanada 2017 Feinsilber 1 1/4 oz reines Silber 9999), sowie die Initialen des Künstlers. 1,25 oz Silbermünze - kanadischer Bison - 2017 Order your 1.25 oz 2017 Canadian Bison silver coin from our online store today to enjoy the lowest price on the web. Established in 1908, The Royal Canadian Mint has delivered numerous successful bullion series featuring North American Wildlife and, with this offering, the majestic Bison is sure to push their reputation for excellence to new heights. The reverse feature depicts a proud and remarkably detailed American Bison, traversing the Canadian wilderness, set within a dazzling border of radial line design. 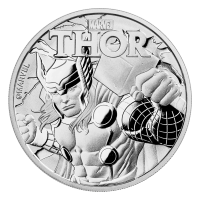 Also on the reverse, you'll find the country and year of origin, as well as the metal content weight and purity of the coin. The obverse feature is none other than Susanna Blunt's famous effigy of Elizabeth II, depicted in her youth and donning her beloved pearl necklace. Also on the obverse is Elizabeth II's formal title, as well as the coin's unique denominational value. The American Bison or Buffalo, which once roamed the plains North America in unfathomable droves, was hunted to near extinction but now populations are back on the rise, thanks to determined conservation efforts. Celebrate the largest terrestrial animal and fortify your holdings with a 1.25 oz Canadian Bison silver coin today.